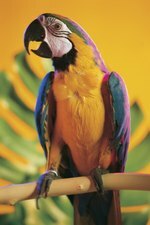 Birds kept as pets, like pigeons, often make excellent companions but have a bad reputation for producing an excess of excrement both inside and outside of their enclosures. Controlling these droppings either by cleaning or by prevention is a straightforward process. Especially when kept outdoors, your best option is to let the pigeon or other bird go where she decides to go, and clean up afterward. Indoors, liners can be placed in cages or enclosures and easily removed and cleaned later. Before you enter a bird's enclosure to clean, don a medical mask or similar device to reduce the risk of inhaling waste particles in the air. The risk of contracting a disease from guano -- bird droppings -- is much lower than the likelihood of exasperating any existing respiratory conditions if you breathe in the dust. Wear gloves to reduce the risk of direct contact with the droppings. Apply water to the droppings before you begin scraping them away to reduce dust from entering the air where you're working and coating other surfaces. Add more water as you get to lower layers of droppings, if the area hasn't been cleaned in a while. Use an ice scraper or a hard-bristled brush to scrape the droppings. Wash away residue with more clean water or transfer droppings directly to a trash bag. Perform this cleaning daily in captive pigeon enclosures. Soften up tough droppings and sterilize areas with antibacterial dish soap. Alternatively, commercial bird-dropping removal solution is also available. Be especially careful when scraping areas such as painted wood, as the droppings may have bonded with the paint and scraping too hard can . If you have any bird droppings on your clothes, mix 1 tablespoon of dish soap with 2 cups of cold water and apply to the stain before washing. If the stain is especially resistant to the dish detergent mixture, use a few drops of hydrogen peroxide and ammonia to treat the stain. The alternative to cleaning up after the bird has done her business is to use specialized bird diapers, also called pigeon pants. Most pigeons tolerate these well, as long as they're changed every three hours. Use these indoors, when you want to have the bird sit on your shoulder, for instance.